What is Connectify Hotspot PRO? Connectify Hotspot PRO is a software router for your Windows PC or laptop. With Hotspot PRO you can transform your PC into a real Wi-Fi hotspot, and share your computer’s Internet connection as Wi-Fi with any other PC or mobile device. How does Connectify Hotspot PRO work? Connectify Hotspot turns your computer into a real Wi-Fi router. Thanks to the “Virtual Wi-Fi” technology that is built into Windows 7 and Windows 8, your Windows laptop can create a Wi-Fi hotspot, even while it stays connected to another Wi-Fi network. However, Connectify Hotspot is a lot more than just a wrapper around these command-line tools. Connectify Hotspot is a full suite of powerful routing software (NAT, DNS, and DHCP) to let you share any Internet connection with any device that uses Wi-Fi. To learn more about the Connectify Hotspot PRO technology, click here. What type of Internet connections can Hotspot PRO share? Connectify Hotspot PRO can broadcast just about any available Internet connection over Wi-Fi. Share 3G/4G mobile broadband, wired ethernet, even another Wi-Fi network at the click-of-a-button. With Hotspot PRO, your Wi-Fi only gaming console or tablet can get on the Internet using a 4G USB modem, you can re-broadcast your home Wi-Fi for extended range, and much more! Connectify Hotspot PRO can even take a Wi-Fi connection and share it over a wired ethernet connection, helping get those old “legacy” devices with no Wi-Fi capabilities onto your wireless network with one click. Can any device connect to the Internet using Hotspot PRO? Connectify Hotspot PRO turns your laptop into a real Wi-Fi hotspot. That means any device that can connect to a regular Wi-Fi hotspot can access the Internet on your Connectify Hotspot. What is the difference between Access Point Mode and Ad Hoc mode? The single biggest difference between the two modes is that Access Point mode allows you to create a hotspot using the same Wi-Fi card that you are using to access the Internet. In contrast, Ad Hoc mode requires the Internet connection to come from a separate card or device such as an Ethernet card, cellular modem, or a second Wi-Fi card in your computer. Access Point mode is also faster, allowing speeds up to 54 Mbps in 802.11g, whereas Ad Hoc is generally limited to the 11 Mbps of the older 802.11b standard. When it is run in Access Point mode, Connectify Hotspot is a real Wi-Fi access point running on your computer. Your laptop or computer is transformed into a Soft AP device. Any device that can connect to a regular access point can connect to Connectify Hotspot, with no special setup or software required. What operating systems does Connectify Hotspot PRO work with? 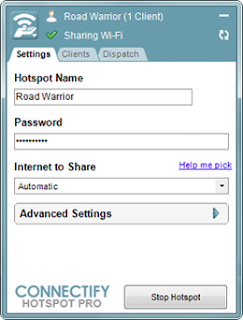 You can use Connectify Hotspot PRO with Windows 8/7/Vista/XP. However, it is important to note that Access Point Mode is only available on Windows 7 or later. That means, in order to share an existing Wi-Fi network with Hotspot PRO, you will need to be running Windows 7 or 8. Windows XP and Vista users can still use Connectify Hotspot PRO, but only in Ad-Hoc Mode, where all other Internet connections aside from Wi-Fi, can be shared with your PC’s wireless card. Anti-Theft – Automatically monitors a missing device and displays its position on a map based on visible Wi-Fi networks in range when it comes online. Anti-Phishing Module - Protects the user from attempts to acquire sensitive information such as usernames, passwords or banking and credit card details by fake websites masquerading as trustworthy ones. 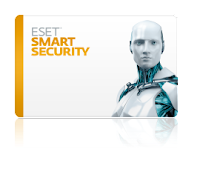 Personal Firewall – Prevents unauthorized users accessing the computer and taking advantage of personal data. The users can go online without worries to shop, bank and use social media. Parental Control – Helps keep kids safe on the Internet with categories of sites to block depending on age. 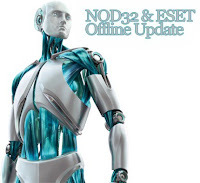 Idle-State Scanning – Performs in-depth scans when the computer is not used, aiding system performance and detecting potential inactive threats before they can cause any damage. ESET Social Media Scanner – it protects the social media user and their friends from malicious content, including profile, the wall, newsfeed and private messages. Antivirus and Antispyware - Provides proactive protection against all types of online/offline threats and prevents malware spreading to other users. Cloud-powered Scanning - Speeds up scans by whitelisting safe files based on ESET’s file reputation database. Scan While Downloading Files - Decreases access time to downloaded files by scanning them already during the download process. TuneUp Utilities® 2012 optimizes the performance of your computer, corrects problems and helps you to customize your system to suit your needs. It combines important aspects of system configuration, security, cleaning and maintenance under a modern interface. You can remove unnecessary files from your hard disk(s), clean and optimize the registry, tweak your internet connection settings, recover deleted files, optimize memory and view hardware information and tips. TuneUp Utilities also includes a Program Deactivator, Uninstaller, registry Editor, Task Manager and even an Undelete tool to recover files that have been deleted from the recycle bin. A very nice tool, with many features that will appeal to novice as well as advanced users, TuneUp Utilities 2012 makes Windows faster, more secure, and comfortable. TuneUp Disk Cleaner now detects traces of over 20 other common programs. The most popular TuneUp modules can now be started from the context menu in the notification area. Live Optimization is now more user-friendly. TuneUp Browser Cleaner now displays more information about the categories to be cleaned up. Internet Download Manager (IDM) is a tool to increase download speeds, resume and schedule downloads. Comprehensive error recovery and resume capability will restart broken or interrupted downloads due to lost connections, network problems, computer shutdowns, or unexpected power outages. Simple graphic user interface makes IDM user friendly and easy to use. Internet Download Manager has a smart download logic accelerator that features intelligent dynamic file segmentation and safe multipart downloading technology to accelerate your downloads. Say No To Maho Blogs. Powered by Blogger.